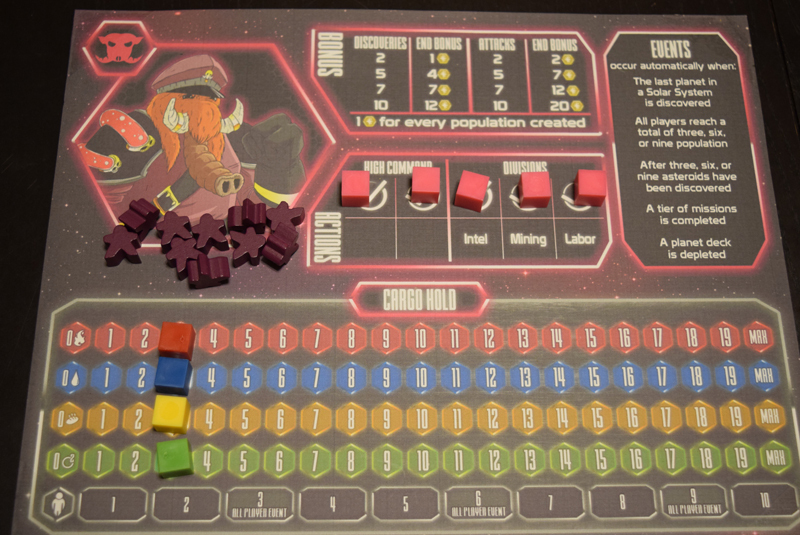 Stellar Leap makes for an excellent introduction to the 4X genre with it's straightforward mechanics, manageable systems, and sprinkling of luck. However, it's appeal is broader than just newbie fodder - there's enough here to keep players coming back for more. Steller Leap, up on Kickstarter right now (and well past funded!) is a light game of dice-driven space exploration and resource management. 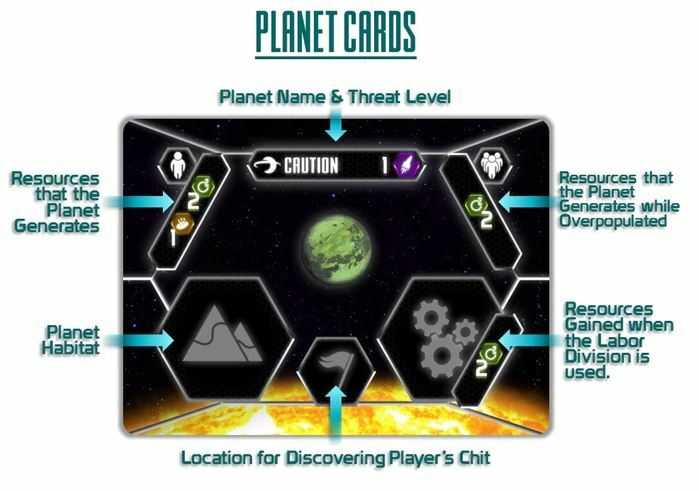 Or, put in less gamey terms, each player will take on the role of one of the space-faring races who are all competing to end the game with the most prestige – a value they will rack up by completing missions, discovering new planets, growing their populations, and fulfilling secret objectives! Jess: Also, there are some space elephants! Setup starts with players choosing their alien race and get their player board, trackers, and home planet. Each player will also be dealt 2 trait and 2 power cards and must choose to keep 1 of each. Power cards will help you adjust your die rolls throughout the game and trait cards are hidden goals that will earn you prestige at the end of the game. You’ll place your home planet in the first galaxy (first row of the planet cards) and as you play you will be expanding out from these home planets to discover more and more of the universe. Each turn of Stellar Leap begins with a dice roll – the faces of the dice, as well as the sum of the dice, will dictate which planet(s) produce resources for any alien races who currently occupy them. Interestingly, planets can host any number of races, but as soon as there is more than one, that planet is considered ‘overpopulated’ and produces fewer resources when activated. Andrew: It is here that those dice-manipulation abilities come into play – you’ll want to do your best to massage the numbers to get planets you inhabit to produce resources. Jess: Yeah, or avoid producing on planets your opponent occupies. You know, if you want to be that way. On your turn you’ll have 2 high command actions and 3 division actions as indicated on your player board. Populate: Spend two food and one water to add one population to a planet that already contains one of your population. Tax:Receive two resources of your choice. Discover: Draw two cards from any planet deck, choose one and return the other to the bottom of the deck, then choose a column. Place the newly discovered planet or asteroid, along with your chit, in the solar system closest to that column’s dice card. Attack an Opponent: Choose a planet to attack and move more population than the sum of all other species’ population to that planet to launch an attack. Intelligence Division: Spend resources to complete missions. Labor Division: Exhaust 1 worker on a planet to receive the planet’s resources. Mining Division: Mine 1 asteroid. As you take your turns discovering planets, harvesting resources, and completing missions, there will be milestones that trigger events. Events are helpful and affect everyone. The game ends after the 6th event is triggered. Add up your prestige earned from completed missions, traits, and player board achievements and whomever has the most points wins! 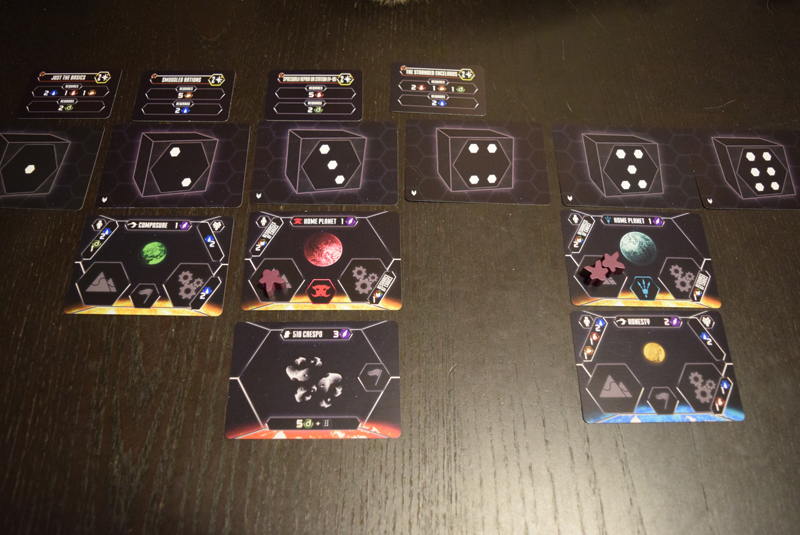 Andrew: One of the things I like most about Stellar Leap is how it makes use of dice to add a little randomness to its otherwise fairly light tactical decisions. Jess: Yeah, especially since the dice can benefit you off-turn. It makes it so that everyone’s turn can be meaningful for everyone playing (dice willing), so it cuts down on the feeling of down-time, which can be a problem in games where players don’t necessarily interact much. Andrew: Totally. And that was another thing I liked – the degree to which you interact is really up to how you decide to play. It’s entirely possible to play in such a manner that you tend to keep out of each other’s way. Or, of course, you can get right up in each other’s business if that’s the game you’d rather play. Central to your success in Stellar Leap is the completion of missions. Each mission, which get increasingly difficult as the game marches on, requires the expenditure of some resources, which you will have gathered from lucky dice rolls and mining asteroids. 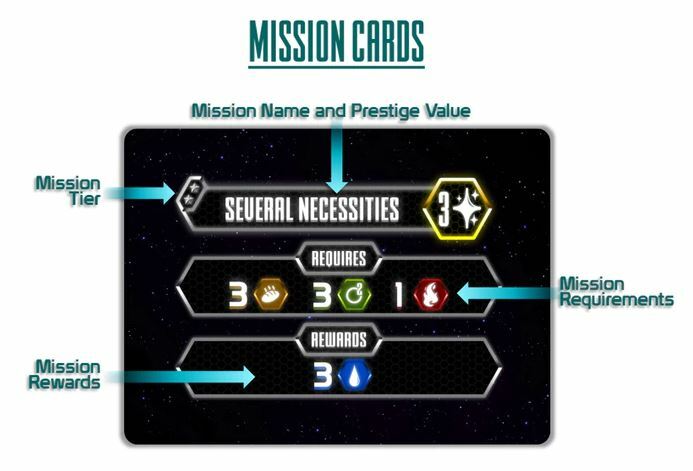 Completing missions will earn you prestige points, as well as resources (which will help you explore some more and complete additional missions). Of course, the dice will be a dividing factor for some people; fans of pure strategy are usually less-inclined towards game which feature them. However, if you can accept a bit of chaos, the dice-manipulation core of Stellar Leap’s gameplay adds some much-needed control to the otherwise-random nature of the game. Overall, we think it works really well, and had lots of fun testing it at various player counts. Our criticisms of Stellar Leap are fairly light. Remembering the triggers for the various events was a little bit of an annoyance – there are several, and keeping them all in mind as each player makes their decisions sometimes resulted in us suddenly realizing we were behind an event (or two ::cough::) which, of course, threw off the pace of the whole game. And another thing we didn’t necessarily love was that, if a player was in a really strong position, it was possible for them to rush the end of the game by actively charging one of the end-game conditions (and hey, that’s a valid strategy, but it felt a little lame). Finally, luck does absolutely play a factor, and when your opponent’s planets keep producing while yours miss, well, you’ll be looking to spread out in no time. Overall, we had a very good time with Stellar Leap. It’s accessible and light, but not boring or uncomplicated. 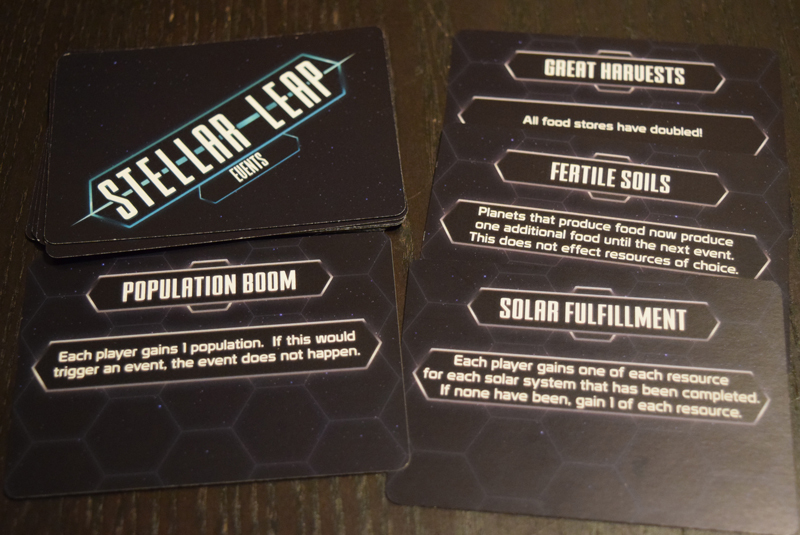 We definitely recommend heading over to the Stellar Leap Kickstarter and checking it out! Previous Post:Check out the Tomb of Annihilation Gameplay Trailer!